In 2017 I am trying something new. My goal is to read through the entire Bible, but not by following any sort of traditional reading plan. Every time I have tried the “read the Bible in a year” plans, I made it through the Books of the Law or maybe through half the Old Testament before I got off schedule and never got back on track. So this time I have no schedule, and I am not going in any kind of order. I have one very simple guideline I am trying to follow: whatever book I am reading at the time, I will read the entire book straight through. I may read it once, or I may read it multiple times. This sounds time consuming, but it actually allows me to adjust my Bible reading based on my schedule. To aid in the process I am mostly listening to my favorite AudioBible, rather than reading. Since I work from home, I tend to watch too much Netflix in the background while I am working on eBay, so I can simply replace some Netflix with headphones playing the AudioBible while I take eBay pictures and create listings. When I have a long time block I can listen to a longer book of the Bible, but when I am time-crunched I can listen to a short book. I am not pressuring myself to read a book every single day, and this project will just take however long it takes. As I work through the entire Bible like this, I want to write down some things I learn from each book of the Bible. I will write whatever stands out to me from that book, and the intention is not to do an in-depth study of every book. I enjoy researching the background and historical context of scripture and hearing what great commentaries say, but that is not the point of this. 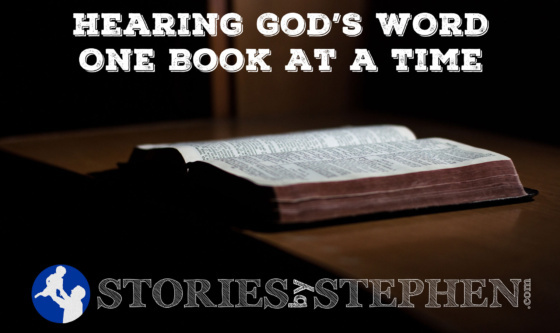 I want to simply hear whatever it is that God intends for me to hear from each book at that time, and then share it in writing. So my thoughts might seem completely random, but they represent a natural way to hear a story, sort of like a stream of thought. Whenever I have read a truly great series of books, such as Harry Potter or Lord of the Rings , I did not dissect every little word in those stories, but I would have an eagerness to find out what happens next and to keep moving through the story. With this experiment I am trying to take the same approach to each book of the Bible, so I am intentionally avoiding commentaries, Wikipedia and study guides. Imagine the 1st century Christians who did not have a New Testament yet. Many thousands of new believers were choosing to accept Christ, and all they had were oral stories that were passed along from the disciples and other witnesses. These Christians were not going line by line through the Gospels and arguing over the exact meaning of this word or that sentence. They were hearing about Jesus via word of mouth and choosing to believe. Today we have every resource imaginable at our disposal to study and gain a deeper understanding of God’s word, but sometimes it is nice to skip all that and simply hear God’s word in a fresh way, uninfluenced by the research of others. I am simply hearing God’s word, one book at a time. I will list all my posts from this series here as I write them.